Submitted by Norm Roulet on Mon, 07/19/2010 - 14:40. 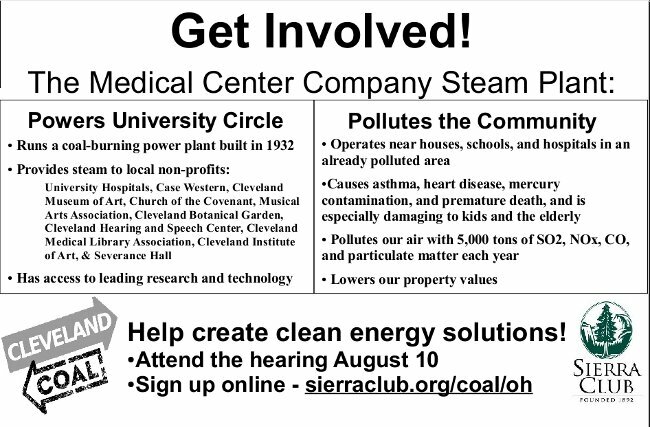 As shall be made abundantly clear before August 10, 2010, when "EPA Hosting Public Hearing to Discuss Citizen Concerns Over MCCO University Circle Coal Powerplant Permit Renewal", over 20 major University Circle institutions including Case Western Reserve University, University Hospitals and the Cleveland Natural History Museum - home of the "sustainability"-oriented "Green City Blue Lake Institute" - are connected to utility services provided by the Medical Center Company, which burns coal in the heart of a residential community of University Circle, bordering East Cleveland, Cleveland Heights and the Little Italy neighborhood of Cleveland. Burning coal causes pollution that kills people and the MCCO coal plant is very old and very dirty - one of the most polluting point sources in Ohio. With the clear blessings and support of MCCO stakeholder institutions and their leaders, MCCO has embarked on an expansion program to build an additional coal power plant facility outside of University Circle, to be located at Lakeview and Euclid, largely in East Cleveland - it is not clear if this is to supplement or replace the existing MCCO plant, which is now a recognized target of environmentalists worldwide. As a dissatisfied neighbor of this coal burning facility, I am proactive to stop it from polluting my community, including acting to have the renewal of their current operating permit revoked and organizing citizens to prevent MCCO from building a coal burning or processing facility in my community of East Cleveland or anywhere in the world, as they have planned. I am proposing MCCO's existing plant be decommissioned and a new energy capability be built to provide comparable utilities processing biomass - I propose the biomass we develop for this be industrial hemp. Such a plant may be an asset to a community and the region and world, but it may not be sited just anywhere. I am evaluating various clean energy alternatives and sites to replace the existing MCCO coal burning facility, and include this site owned by one of the MCCO stakeholder organizations - Case - that is not safe for human occupancy while this coal plant operates within clear sight, but would be logistically ideal as a site for a clean energy replacement plant tied into existing MCCO infrastructure. 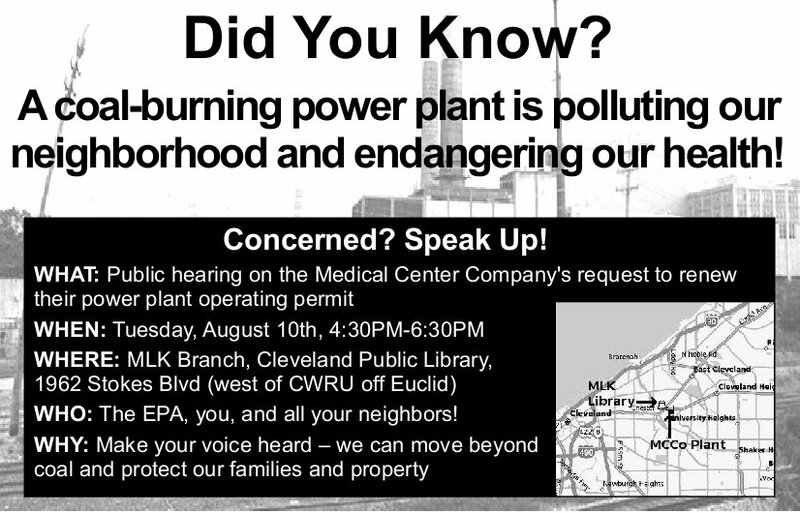 "EPA Hosting Public Hearing to Discuss Citizen Concerns Over MCCO University Circle Coal Powerplant Permit Renewal"
Who: The EPA, you, and all your neighbors! Help create clean energy solutions! Submitted by westward on Mon, 07/19/2010 - 15:25. I hope that you don't mind this piggy back to your posting, Norm. People need to wake up and start to clean up. This information was prior to Mittal, and the pollutiion is only worse. Read more for Cuyahoga County being in the top rankings in the past. Are we any better? Submitted by lmcshane on Tue, 07/20/2010 - 09:51. But, it alarms me that the data is from 2002--IGS is listed as the top polluter in NEO. ISG is now Mittal Steel. I am afraid that, as Norm has pointed out, time and time, again--we just prefer to ignore the fact that we are being poisoned to death. Does the healthcare community in NEO (and worldwide) actively suppress environmental data collection?? NEO hospitals and doctors need to heal themselves first. Doctors can not continue to operate with the mentality that they can create their own income stream of patients by condoning the pollution that generates patients in NEO. I want to see doctors speaking out against the fallacy of "clean coal." I would like to see Dr. Gus Kious be the first one to stand up against this heresy. Submitted by Norm Roulet on Tue, 07/20/2010 - 10:49. I'm putting the pressure on - the Sierra Club is in town to educate Cleveland leaders that clean coal is a lie and all coal burning kills - I've asked councilman Cummins to arrange for the Sierra Club to speak to Cleveland City Council, asked Councilwomen Thomas to arrange the same with East Cleveland City Council, and asked Chris Ronayne to arrange the same education process with all MCCO/UCI stakeholder organization leaders. I'm contacting the Gund family about arrangements to educate people at the foundations. Submitted by Norm Roulet on Tue, 07/20/2010 - 12:01. And yes they hide the pollution on purpose and I am looking to have the Federal EPA sue the Ohio and local EPAs for that. Norm, something you might have an interest in? Submitted by jerleen1 on Wed, 07/21/2010 - 10:41. Lois Gibbs to speak at Pilgrim Church Wednesday, July 28th, 7:00 p.m. Please join Ohio Citizen Action on Wednesday, July 28 at 7:00 p.m. to hear internationally known environmental activist Lois Gibbs tell the story of her work at Love Canal, New York. Lois Gibbs became famous after she and others in Love Canal discovered that the local elementary school and their homes were built on a toxic waste dump. Lois emerged as a leader within the community and helped to get 833 families relocated and the cleanup of the area started. In 1982 the community's story became known nationally when the made-for-TV movie Lois Gibbs: the Love Canal Story aired. On July 28 Lois will share the lessons she learned during her work in order to help other communities struggling with pollution problems today. Lois Gibbs currently works as the Executive Director of the Center for Health, Environment and Justice, a grassroots environmental group formed in 1980 to help other communities dealing with environmental justice issues across the country. She will be speaking at Pilgrim Church in Tremont, 2592 W. 14th St., at 7:00 p.m. on Wednesday, July 28. The event is free and open to the public. For further information contact Liz Ilg with Ohio Citizen Action at 216.861.5200 x305 or lilg [at] ohiocitizen [dot] org" shape="rect" rel="nofollow" target="_blank" ymailto="mailto:lilg [at] ohiocitizen [dot] org" style="color: blue; font-weight: bold; text-decoration: underline">lilg [at] ohiocitizen [dot] org. "to help other communities struggling with pollution problems"
Submitted by Norm Roulet on Wed, 07/21/2010 - 11:38. "to help other communities struggling with pollution problems" - thanks for posting this... she is coming to the right town and part of town.